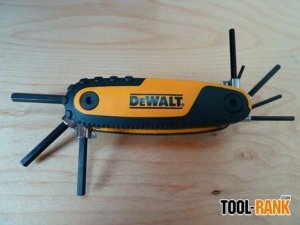 I was a bit skeptical when I first heard that DeWalt would be making hand tools. I figured the tools would just be re-branded Stanley tools, like the Bostitch hand tools were. How would a bunch of re-branded hand tools be interesting news for you to read? It wouldn't, but thankfully for all of us, the new DeWalt tools are not just a simple logo change. The DeWalt line of hand tools look like they were built upon Stanley models, but also improved upon. As a way to show the skeptics among us what they really had, DeWalt sent over a few of their new hand tools for me to review. One of the new DeWalt tools that really caught my eye, was the Locking Hex Key Set. The set looks very similar to some of the Stanley hex keys sets, but this new DeWalt Set brings a huge new advancement to the folding hex key world. Each one of the 8 different hex keys has the ability to lock into position on the handle. In fact, each key can be locked into 3 different positions, 90-degrees, 135-degrees, and 180-degrees. You no longer have to worry about the keys folding under pressure when you use them. This reason alone was why I decided to go with standard L-shaped hex keys when I purchased my last set. My old L-shaped hex set is now confined to the garage, while the DeWalt Locking Hex Set has taken its place in my everyday tool bag. Trying to keep track of loose L hex keys gets annoying after a while. The SAE set I have has hex keys in the following sizes: 3/32, 7/64, 1/8, 9/64, 5/32. 3/16, 7/32, and 1/4-inch, and DeWalt also has a 8-piece Metric version. The five smaller keys are on one side, and the three larger are on the opposite. Each key is labeled, the smaller are labeled in the plastic, but the larger keys are labeled on the keys themselves. The plastic labeling is much easier to read, and I fear that over time the metal labels will rust and become harder to read. For the most part I just find the size I need by test fitting, so this is not a big deal to me. In the case of these hex keys, DeWalt has not done a simple re-brand, but has really come out with a handy new improvement. At around $17 for each set, they are more expensive then other folding hex sets on the market today, but the locking feature might just be enough to get you to spend a bit more. Both the SAE and Metric version can be found at Amazon. Currently DeWalt is not offering a set with both models.